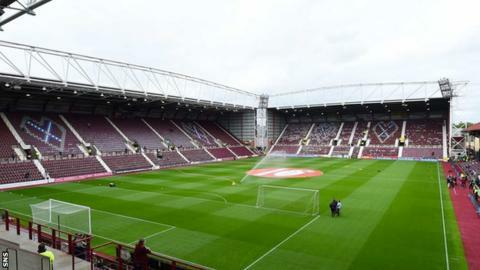 Hearts are to increase stewarding and police monitoring - and ban some fans - as a result of an incident with a Ross County supporters' bus on Saturday. The group known as the "Young Team" are accused of pushing a driver and stealing a drum and a stewards' cap. Hearts also condemned again the setting off of flares inside the stadium. "It gives us no pleasure to say that a number of fans will be banned as a consequence of their recurring bad behaviour," said the club. "Within the stadium at all forthcoming home games, we will have a greater stewarding presence and, on some occasions, police will be monitoring certain areas directly. "We are also now looking at implementing much more strenuous ticketing control measures." Hearts expressed their disappointment that club owner Ann Budge had been forced to apologise to their Scottish Premiership rivals and their travelling fans "for the appalling behaviour of a small group of 15-25 young so-called Hearts supporters". "The club does not need these individuals and, most certainly, does not want them if this is going to be the way they continue to behave," said the Edinburgh club's statement. "We have been working closely with Police Scotland and other agencies to gather sufficient evidence against the individuals involved to enable the appropriate action to be taken." Hearts, who beat County 2-0, also promised to work with schools and social work departments to tackle the problem. "We find it incredible that, even following the terrifying ordeal a young Hearts fan had at Celtic Park due to pyrotechnics in our section, an incident which led to him receiving medical treatment, certain individuals still chose to repeat this utterly irresponsible action again on Saturday," Hearts added. "Our inbox at Tynecastle is filled with emails from Hearts supporters asking us to take action and we want to assure them that we will not rest until we have satisfactorily addressed this problem."